During discussions about the Conscious Capitalism and Benefit Corporation movement or my own book Corporate Empathy the conversation often has some focus on social entrepreneurship and social enterprises and what the potential is for these kinds of businesses. According to Wikipedia, “a social enterprise is an organization that applies commercial strategies to maximize improvements in human and environmental well-being, rather than maximizing profits for external shareholders.” which sounds rather progressive in our shareholder driven economic system dominated by multinational corporations. However “social enterprises” are simply a return to traditional business ideas, commonplace prior to globalization. Social enterprises look at a societal need and provide a business service or product to fill that need. The only difference between a social enterprise and your average multinational is the fact that large global companies are only just beginning to explore the potential of these ventures. Like globalization at the turn of the century the most innovative companies are leading the way. Once the path has been cleared you can expect every business that survives to have followed suit. Globalization spread through the entire world economy, reducing costs and increasing profits because a company could always find a person willing be paid just a little bit less money. 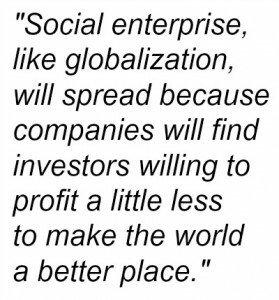 Social enterprise, like globalization, will spread because companies will find investors willing to profit a little less to make the world a better place. Short-sighted lazy for-profit enterprises and inefficient bloated non-profit organizations should be aware that social enterprises will target them to aggressively grow market share.